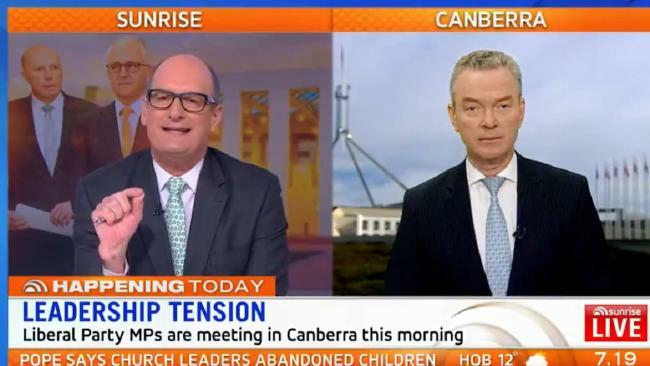 SUNRISE host David Koch has told Defence Minister Chris Pyne to "grow a pair" in a heated interview this morning ahead of the Liberal party room meeting. Kochie asked Mr Pyne - one of Prime Minister Malcolm Turnbull's loyal supporters - who was stirring the pot at the "nutty end" of his party and asked him, apart from Tony Abbott, who was bringing this about. "Grow a pair, you know who's pushing for this," he told Pyne. 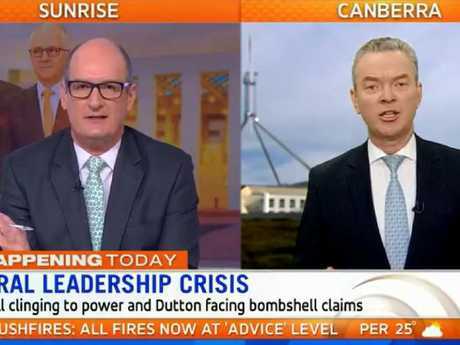 Pyne then fired back, telling Kochie to grow a pair because he would hear the troublemakers' phone calls as well. "I'm not going to out anonymous people because I don't know exactly who they are. I suspect, but I don't know for sure," he said. Mr Pyne said he had spoken to Mr Dutton and he had told him Mr Turnbull had his "absolute support" and spoken to all cabinet ministers and everyone had told him they supported their leader. "If there are people who are saying behind-the-scenes that that's not true then I guess they have to examine their own conscience," he said. "We have absolutely every reason to believe we'll win the next election." Mr Turnbull declared the Liberal leadership vacant at the party room meeting, and in the ensuing vote, defeated Mr Dutton 48-35. The Prime Minister had gutted two of his own signature policies in the last 24 hours in an effort to save himself, removing the carbon emissions target from the National Energy Guarantee (NEG) and depriving the Big Four banks of his company tax cuts. Kochie kept pressing Mr Pyne, asking again if everyone was unanimous in their support, who was stirring the pot. "There are people who work behind-the-scenes who are obviously disgruntled for one reason or another and they've been working behind-the-scenes probably for some time," Mr Pyne said. "At least Tony Abbott is publicly out there calling for a change." The federal member for Sturt said the public would react very negatively to another change in leadership without having a vote. Kochie asked why Mr Turnbull backed down on the energy policy and did not "stand up to the nutters" in his party and say, "'I believe in this, I'm the leader, this is my vision, back off.'" "He showed weakness," Kochie said. Mr Pyne replied "not really" and said they announced some of the toughest policies yesterday. "The reality is we've got a one-seat majority, there were four people last week who said they wouldn't vote for it, so why would the Government introduce a piece of legislation where four people were going to cross the floor and defeat that legislation," he said. He said the last time that happened was when Malcolm Fraser did it on aviation in the 1970s.